Sara Lee ( a company of Bimbo Bakeries USA) is a leader in the baking industry, known for its category leading brands, innovative products, freshness and quality. Sara Lee’s microsite (thejoyofeating.com) is a place where customers of Sara Lee can collaborate and share new ideas regarding Sara Lee’s food products. 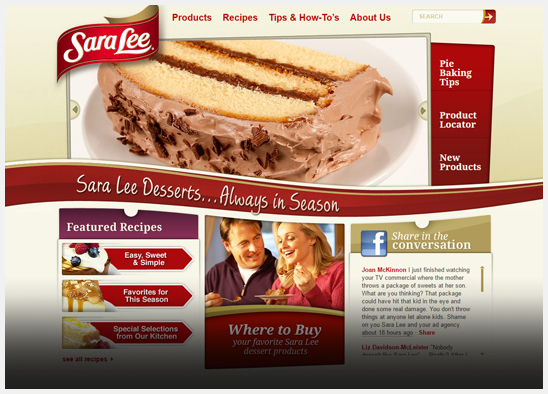 The main goal of this web presence was to create dialogue amongst the public regarding the different uses of Sara Lee’s products. This site was to allow users to view different products, submit recipes that they’ve created themselves, and/or download recipes uploaded by other users. The goal of the site was to create an interactive and fun way for customers to share their recipes with the public. HTML5 – User interactivity required by Sara Lee. HTML5 allowed the site to be animated, fun to look at, and interactive. ASP.Net – ASP.Net was necessary in order to allow users to exchange data with the website. 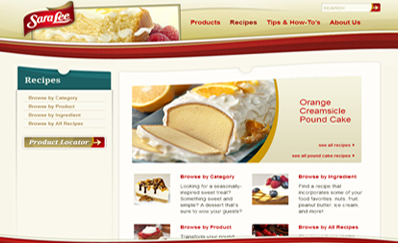 ASP.Net was used to pull dynamic product information from Sara Lee’s database and allowed users to upload and download recipes on the fly. A Custom CMS was also created to allow the site administrators to monitor uploads and postings to the site regularly. The CMS also allowed for adding new products and recommended recipes from Sara Lee. The result was a successful microsite that is now printed on the packaging of hundreds of Sara Lee’s products world wide.